Since the last general update I’ve published the MFPP booklet, Autumn Nostalgia; finished my patterns for Hitch (a total of four – a pair of fingerless mitts, a hat, and two very different cowls); and been working, of course, on designs for the next book. 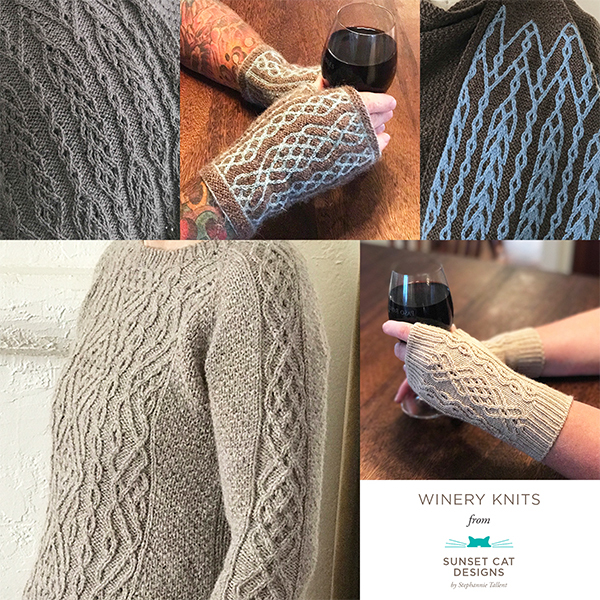 Although the bulk of my knitting will be for the next book, I’ve a couple ideas for standalone patterns to release in the meantime, and I’m thinking of submitting at least one design for the next Knit Picks collection. Tech editing? Hitch, of course, and a couple other things with which I’d previous commitments. No new clients til at least early/mid November. Teaching & travels: Rhinebeck is NEXT WEEK. Oh my gosh. With all the other stuff I’ve been doing (vet work, etc), the time passed quickly. I’m going to be a Rhinebeck Bingo square. Find me in the Cooperative Press booth! And…if it’s chilly enough, I’m planning on wearing a sweater that will be in the next book…. Don’t forget to check out the Cooperative Press party in town Saturday night — details here or here. I’ll be teaching at Madrona 2013! Check out the overview — there’s an amazing group of teachers and classes. The conference is fantastic — intimate settings, great teachers, fun evening programs, and a fabulous market place. I’ve been thinking about what I’m going to do this time to utterly humiliate myself for the teacher talent show. My act will be, at least, entertaining. I’m planning on singing. For those who know me, you know that, however enthusiastic I may be, I don’t really sing that well. But I enjoy it. KALs: The Wrought Mitts KAL was fantastic! The Wrought Socks KAL is still ongoing, and the socks people have done are just lovely. The next KAL will be a general one — think small projects for holiday knitting (for gifts or for yourself).